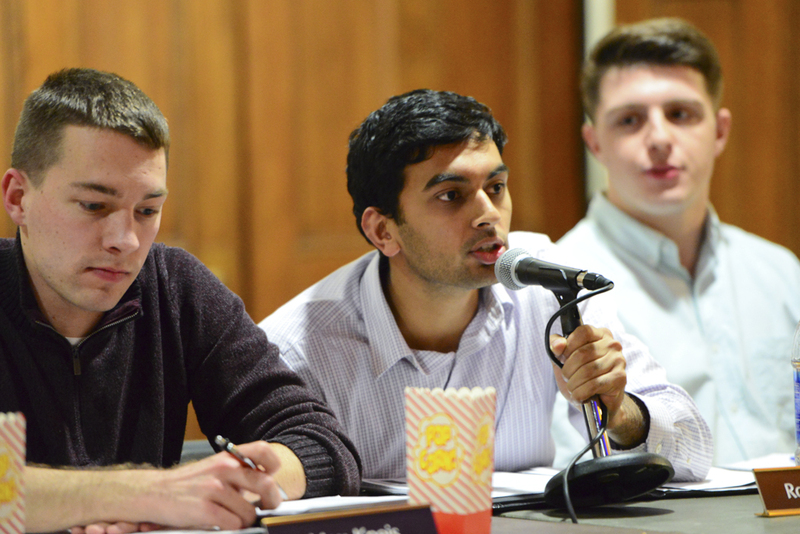 Pitt Student Government Board held their first monthly town hall-style meeting Tuesday night, cutting board member reports to focus on students who wanted to voice their concerns. Other than this change, the town hall remained mostly similar to a standard SGB meeting, featuring updates from each committee head and allocations requests. SGB made the decision to change the format for Tuesday’s meeting to accommodate students with busy schedules who have limited time to express their concerns, according to SGB President Natalie Dall. “I think a lot of students may not want to come to public meeting because it’s long when we give all of our reports, and I think a lot of students don’t have the time to commit to that,” she said. Vice President and Chair of Cabinet Rohit Anand said the town hall-style meeting was meant to establish a stronger relationship with students and the Board and create transparency with their initiatives. “We want to make sure that students are informed about what initiatives we’re carrying out and have the ability to present a resolution or comment on what initiatives we’re working on and give us feedback,” he said. Rohit said SGB plans to reach out to all of the student organizations on campus and market the newly styled meetings on Facebook. The next town hall meeting is at the end of February. Despite the decision to strike reports from the meeting, Dall still had updates from the Board on the progress of the tobacco-free initiative discussed in last week’s meeting. At this meeting, SGB introduced a new initiative that would allow them to apply for a $20,000 grant to educate students about tobacco use. The grant, from the American Cancer Society, is given to 20 universities in an effort to “accelerate and expand the adoption and implementation of 100 percent smoke- and tobacco-free campus policies,” according to an ACS press release. The Board tabled their vote until next Tuesday’s meeting. If the vote passes and SGB receives the grant, they plan to hold events to educate students about the effects of smoking and tobacco use. Dall also said last week the key focus of this proposed resolution was promoting smoking and tobacco-use education. This resolution is distinct from last year’s tobacco-free resolution, which would have banned tobacco-use on campus. That resolution never went to vote last year, as student surveys indicated a near-perfect split in support. Although attendance at the town hall-style meeting was modest, two students took the opportunity to address the Board about pressing concerns. One of the speakers, Sam Ressin, a first-year student, voiced his support for the tobacco-free initiative. Ressin said the smoke concerned him because he struggles with asthma. He said that he currently takes a different, more complex route to classes to avoid smokers. “I do worry that it could make it worse, and I do want to speak out for those who have severe asthma or respiratory problems,” he said. Dall also reminded the crowd that all students who want to run for a board position next year and already handed in SGB packets with the appropriate amount of student signatures can start campaigning tomorrow. The Panther Judo Club requested $4,248.99 for airfare, registration and ground transportation for the NCJA Collegiate Judo Championships. The board denied $2,836 and approved $1,412.99. The Hindu Students Council requested $1,660.80 for their spring event. The board approved in full. Pitt U.S.I.T.T. requested $3,383.60 for transportation and lodging for their national conference. The board denied $2438.39 and approved $945.21. C Flat Run requested $1,251.64 to attend the International Championship of College A Cappella quarterfinals in Ithaca, New York. The board approved in full. The Women’s Volleyball Club requested $7,390.36 for airfare and lodging to attend the NCBF Collegiate Club Championships. The board denied $743.20 and approved $6,647.16.